Telomeres—too much of a good thing? One of the major themes in aging science of the last 15 years has been that there is natural variation in telomere length, and individuals with longer telomeres have lower disease risk and longer life expectancy than those with shorter telomeres. A paper last week in Nature Structural and Molecular Biology found that stem cell telomeres are actively maintained at a target length, not just by elongation (with telomerase or ALT) when they get too short but by active trimming when they get “too long”. We know what “too short” means: short telomeres lead to cellular senescence. Cells with short telomeres are not just falling down on the job; they are toxic. But what does it mean for telomeres to be “too long”? The headline in MedicalXpress says “Scientists find that for stem cells to be healthy, telomere length has to be just right”. The story underneath includes the claim that “really long telomeres caused telomeric fragility, which can lead to initiation of cancer”. But now that I’ve read the research article on which it is based and some of the references in that article, I see that the part about cancer was tacked onto a (new and interesting) research finding. I’m convinced that the meme “long telomeres lead to cancer” has been resounding in an academic echo chamber for 25 years; that it never has had an experimental foundation, and its theoretical foundation is just wrong. What is new and interesting is this: researchers at Salk Institute have discovered a mechanism for trimming telomeres. In our previous understanding, telomeres lose length every time a chromosome is copied (every time a new cell is created). Telomeres are partially rebuilt by the enzyme telomerase, or by a less direct mechanism called ALT. Telomeres are fully rebuilt only when new life is created, in a germ cell or a fertilized egg. In the previous understanding, shortening of telomeres is passive, while lengthening is active. The new study documents an active mechanism for shortening telomeres. Part of each telomere is unpaired, a single strand of DNA extending past the end of the chromosome, and folded back over the main (double-stranded) part. Single-stranded DNA normally means a problem, and the cell nucleus has multiple means to repair or degrade it. To protect the telomere from being attacked (to prevent fixing of what ain’t broke) the telomere is chaperoned by various protective proteins, most famously shelterin. We have known that stem cells can express telomerase to counteract telomere shortening, though (in humans) there is not enough to keep telomeres from shortening progressively through a lifetime. The new finding is that when a stem cell detects that telomeres are “too long”, there is a way to trim them back. A strand of DNA is manufactured that is complementary to the telomere’s repeated sequence TTAGGG. 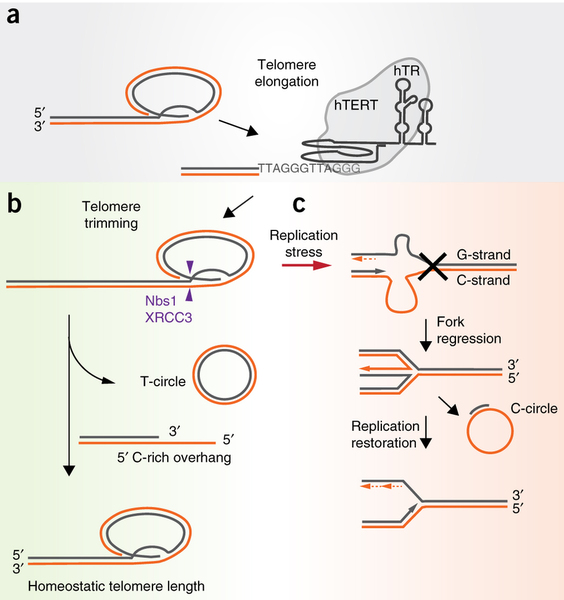 The complementary strand (that would be AATCCC, repeated) has an affinity for the telomere repeats, and it finds and binds to a segment of telomere, then circles, “bites its tail”, and breaks off a ringlet of double-stranded telomere-stuff (called a T-circle), effectively shortening the telomere. What’s wrong with extra-long telomeres? The obvious question: why is the cell doing this? What is the danger of telomeres that are too long? One natural place to look is in the telomere position effect (TPE). Telomeres fold back over the chromosome in such a way as to silence genes near the ends. We might expect that the right genes must be silenced at the right times, and that silencing too many genes with an extra-long telomere would cause problems. My own best guess is that this is the right answer. Another hypothesis is that extra-long telomeres are inherently unstable and unmanageable. But the present studies were done with human cell cultures, where telomeres are ~10,000 BP in length; mice commonly have telomeres ten times that long without causing problems. The conventional hypothesis is that telomeres are trimmed to prevent cancer, and that is the spin put on the findings by the authors of the paper in their press release. “We were surprised to find that forcing cells to generate really long telomeres caused telomeric fragility, which can lead to initiation of cancer.” In the paper itself, they were more circumspect about this explanation, as is academically appropriate. These people are masters at what they do (Since spending time at NIBS in Beijing, I have an expanded awe for the experimental virtuosi who are able to infer reliable data about the inner workings of cells.) But they are not theorists and they trust the community of biological theorists to supply the theoretical framework for interpreting their result. In this case, the trust is misplaced. The idea that telomeres are kept short to prevent cancer was originally proposed by (Nobel laureate) Carol Greider (1990), and has been promoted most explicitly by Judith Campisi (1999) before she became convinced by experimental data that the situation is more complicated, that short telomeres are more likely to cause than to prevent cancer (2013). Through strength in numbers the cancer/telomere hypothesis has achieved “echo chamber” status–many researchers cite each other’s secondary statements on the subject, until tracing the empirical support for the hypothesis becomes unnecessary. It is common knowledge. One of the authorities cited in the original paper is this article which is actually about deletion of a gene for a shelterin-related protein that binds to telomeres. When this gene is deleted, telomeres become unstable and cancer rates rise. But the article is not about telomeres that are “too long”. Another authority for the hypothesis that is cited in the original paper is this book chapter. The chapter is not about cancer, but it does peripherally cite this study from NCI, which finds that cancer is associated with short telomeres, but not long telomeres. Just last spring, Maria Blasco’s group at the Spanish National Cancer Research Centre gave us this study, in which stem cells with hyper-long telomeres (up to 300,000 BP) were introduced into mice (in which telomeres normally are already 10 times as long as humans’). “Mice with hyper-long telomeres…accumulate fewer cells with short telomeres and less DNA damage with age, and express lower levels of p53….We further show that wound-healing rates in the skin are increased in chimaeric mice.” No life span data is reported, but cancer risk was lower in the mice with hyper-long telomeres. This study from another research group at the same institution linked the extraordinary healing and regeneration capacity of very young mice to their extra-long telomeres. In this study from UCSF, published just this fall, heart patients whose telomeres were lengthening over the four-year span of the study had 1/3 the mortality rate of matched patients whose telomeres were shortening over the same time span. Are short telomeres a symptom or a cause of age-related disease? This is a controversial question only because the causal hypothesis is in direct opposition to standard evolutionary theory. So much the worse for standard evolutionary theory. One causal mechanism which is incontrovertible is that cells become senescent when their telomeres shorten beyond a critical length. Senescent cells are not just non-functional, they are toxic. Removing senescent cells from the body has been shown to lengthen life span in mice, and senolytic agents are being developed for human use. Many of us in the life extension movement regard senolytics as the #1 most promising strategy for major life extension in the near term. The question of causality can be answered definitively by intervening to make telomeres longer or shorter “by hand”. If short telomeres are a mere marker of past stress, then this should make little difference in the trajectory of aging; but if short telomeres are a cause of aging, then we expect that lengthening telomeres should lengthen life expectancy and lower the (age-adjusted) risk of disease. In fact, this experimental model has been realized several times in mouse studies, two of which are referenced just a few paragraphs above [#1, #2]. The most dramatic success was in dePinho’s Harvard lab, but there are also impressive results from Blasco’s group in Madrid. If lengthening telomeres is an effective life extension strategy for mice, it should be all the more so for humans, who have shorter telomeres, longer life spans, and less telomerase than mice. In the face of this evidence, there are still some influential researchers and advocates in the anti-aging community who opine that “On the whole telomere length looks a lot like a marker of aging rather than the cause of problems: the groups that primarily seek to engineer longer telomeres in search of a way to slow aging are probably putting the cart before the horse.” [quoted today at FightAging.org] Meanwhile, Michael Fossel has initiated a clinical trial of telomerase gene therapy to treat dementia. Cancer scares from the echo chamber are spooking the venture capital that would be so welcome for startups that are seeking to bring telomerase therapy to the public. Careful. Correlation is not causation. It could just be that, because they are healthier, they reproduce for longer or are able to start later. I don’t think you need much caution here – the authors start with a plausible known mechanism (telomeres lengthen in sperm cells over time), and replicate a previous finding that telomere length correlates with paternal age. There’s some interesting multi-generational analysis comparing grand-parents with their grandchildren vs fathers. eg, Your grandfather can “bank” longer telomeres for you, regardless of when your father conceived you. and they are likely to have more genetic defects. I don’t think it is a case of long telomeres causing cancer, but giving somatic cells the ability to elongate their own telomeres would make it easier for cancer to get started. Therefore a treatment would need to lengthen the telomeres of somatic cells in one go (or periodically) but not continuously. Or alternatively you could target it at stem cells to keep them working and doing the job for you. Great article Josh. So do you think this could be a mechanism in the development of cancer stem cells? Also maybe open the way to another universal cancer treatment upregulating it enough so it counteracts telomerase? Or on the other hand to an antiaging therapy downregulating it in old people with already short telomeres? What really is needed is a DNAmage type methylation model for aging. Can a cheap nanopore sequencer be used to build a model that correlates DNAmage to telomere length? Across many species? Sperm, egg, tumor, etc. transposable elements, high copy genes, segmental duplications, and centromeric/telomeric repeats that are difficult to assemble with short reads. Can a cheap MinION replace Illumina? I worked on telomeres at Los Alamos at US Human Genome Project. Cost of sequencing is rate limiting in much bio research today. I bet that TRIMMING GOES WILD at a certain moment, in order to enforce the aging program. It would be interesting if that could be observed, but my guess is that aging is less directly programmed, more intricately tied in to other processes. Josh you don’t consider that upregulating a natural cellular process to a harm causing level would be an example of the aging program tied in to another process? I think that is certainly something to watch for, because if the active management of telomere length wasn’t adjusted to “just right” but instead to a shorter length expected for the age of the cell, that would certainly argue for age enforcement. However, in either case, active management seems to disqualify telomere length as a primary aging clock. At best a secondary clock managed based on other criteria. This is a really good point. Last year, I argued that resetting the telomere clock would buy us ~5 years of human life expectancy, consistent with the idea that telomere length is a secondary aging clock. Geez only 5? But I guess that’s 5 additional years to the lifespan of an individual if nothing else is done? If we had a comprehensive therapy that allowed us to go past the current maximum human lifespan don’t you think it had to be part of it? Telomere attrition is just one of the many triggers of senescence. I think one can think of it as a kind of DNA damage. Senescence is usually caused by two major pathways p16 or p53. P16 is mostly switched off in mouse cells (maybe because they express telomerase?). P16 pathway is also switched off in human cells which express telomerase. Telomerase enzyme immortalizes cell lines and suppresses senescence – possibly even when it shouldnt. On the other hand long telomeres in themselves are probably harmless and increasing fitness. However I think this evidence is far from causitve. In my opinion telomeres are just one of the many downstream effectors of organismal fitness. but the epigenetic signature only resets at conception. My estimate for regenerative cell therapy is 20-50 years from now. Research will get a lot of funding once someone makes a small breakthrough such as a 6 year old mouse that has the possibility be translated to human treatment, i.e. not transgenic mouse. Dollar billions will flow to startups that are experimenting with cell cultures that can potentially be injected to humans. Actually I think research has been for decades so focused on winning the war against cancer that small attention has been paid to primary cell cultures. Stem cell cultures usually have a low yield and injected stem cells die soon, why? Surely it could be helped somehow. Primary cell human cultures show different aging behavior depending on tissue type. Some cells in cell culture age very fast (usually of ectodermal origin), some are not – an example is fibroblasts of mesodermal origin. Why? No one cares. Its just “culture shock” they say. Come on. If Alexander Flemming had thought so I wouldnt be alive today. This is basic research with low hanging fruits. Concernig CARS and its main components I hope to be able to send my big review to you (mtDNA fragments inserted inside nuclear DNA, CARS, and Evoaging programmed. Meanwhile please read my Gene Cluster of Aging Hypothesis paper on Biogerontol. 2008 and our last study on rapanycin and the fragments etc Martinez-Cisuelo et al. Exp. Gerontol.2016. Josh, I know you like the telomers and do not consider enough that aging is (please note that I say mainly; I do not say “only”, I just say “mainly”) a problem of postmitotic tissue cells. But concerning survival curves all of us must be very demanding if we do not want to confuse ourselves. I do not think Blasco and specially dePinho studies should be labelled “dramatic succes” (in terms of longevity increase). Good work they are, but Blasco fig. survival curve maximum longevity obtained in experimental animals is 180 weeks = 3,45 years only. Just as an example our controls (DBAxC57) reached 3,9 years (Fig. 1 in Gomez-A et al., Aging Cell (2014) 13, pp551–560 Doi: 10.1111/acel.12205 ). And concerning de Pinho paper, I could not find any single survival curve on that article. I am not expert in telomers. But if these two papers are the best for telomers in terms of demonstrating increasing longevity in mice….then the telomere story needs much further demonstration, obviously. Just think mutant mice that live longer than 4 years (that is much more demonstrative). In other words if I increase human longevity (in a imaginary experiment in a group of humans I mean) from e.g. 60 to 80 years I have demonstrated absolutely nothing concerning decreasing aging rate. Whereas if I increase human life span from 122 (Jean Calment) to 150 years (or around 170 like in the 1.4 fold mutant or CR mice) then it is sure that I must have decreased human aging rate….. And that is really what is needed if we seriously want to defeat most cases of all the degenerative diseases with a single manipulation and really increase the healthy life span. For me the next challenge is to get the 6, 7, 8 year old mice. I think this not only possible but very easy to do indeed! The only problem is that we still do not know how to do it because we have not selected the right target (for me that target is within the nucleus). To the best of my knowledge up to 1.4 fold life extension is obtained in most animals (including rats and mice) and rhesus maquaques (Coleman Science 2009, not matter Mattison Nature 2012) by caloric restriction, with around half effect (1.2 fold) by methionine restriction, and by around (1.14 fold) 14% (last Miller et al results included) by rapamycin. And by nothing else in mammals apart from the many single gene mutant mice. These increase maximum longevity over that of NORMAL controls (especially CR and mutants). But telomers never demostrated that as far as I am aware. And I am eager waiting after decades to see what happens to telomers in caloric restriction and, most important, what is the correlation between telomere legth and species specific maximum longevity? Why nobody publishes those critical experiments? (I know that mouse telomers are much longer than those of humans and that of course does not correlate in the “right” sense, it is the opposite. Buit what about the other mammalian species? Or their rates of telomere shortening, or in DR, in MetR? with rapamycin? (And species comparisons are the most important thing becasue with DR and single gene mutants the maximum increase in maximum longevity obtained is around 1.4 fold in mammals but never much more than that. Whereas across species we have, already inside mammals, 35 fold! difference in longevity (and aging rate) from mice to men. And what we need to get negligible senescence is much less, only 10 fold (1,220 years at minimum for future humans…). So, please look at the (mammalian) species. That is “the big thing”, the DRs are the “small thing” in terms of aging rate difference. And if you do it, please do not correct by body size (Barja J Gerontol A Biol Sci Med Sci 2014; doi:10.1093/gerona/glu020) or, if you do it please show BOTH the corrected and the non corrected values. And please also remember that any theory of aging must explain why the longevity of different mammalian species varies so widely . Whitout that most important requisite, any theory of aging can not get validity (other things are needed to be demonstrated too of course, like increasing longevity over that of normal controls). I profite to remind people (specially in USA where it became in fashion lately to considert mito-ROS aging theory “dead”) that the only theory that fits BOTH with interspecies comparisons and with the positive effects of CR, MetR and rapamycine is the a mitochondrial free radical theory of aging that focuses on mitROS production instead of in antioxidants (the old and clearly wrong ROS theory of aging). If I am wromg in that last statement, and there is any other theory (telomere related or not) that can explain all those things in mammals, please make me aware of it. Thank you and sorry for being so long again. Interesting, that is your educated guess or can you quote any study that links longevity to mito-ROS production or detoxification capacity that is consistent within and among species? Se first part of my review Barja-G Antioxidants and Redox Signaling 2013. I am finishing a much more update review with interesting information. So what do you think about SkQ1? Do mitochondria targeted antioxidants make sense or are they as worthless as systemic antioxidants? Metformin is prescription only too (in UK), but Berberine is not – also inhibits Complex I, and is inexpensive. I had a research idea before e.g. take the naked mole rat genome and take the mouse genome. Define the philogenetic tree for their genome and start replacing mouse chromosomes with naked mole rat chromosomes one by one. If the chromosome swaps do not yield viable animals, start to replace chromosome segments by the philogenetic tree between the two animals. Basically replay evolution in a fast forward fashion. If we are lucky we could get chimeric animals that are longer lived than normal mice and thus zoom in on regulators of aging. If we are not lucky, lifespan is controlled by many small interpspersed motifs that are recognized by epigenetic effector enzymes such as histone modifiers. Now that you mention it the naked mole rat was one of the last nails in the coffin for the ROS theory of aging since they have much more than ordinary mice yet live 10 times longer. I don’t know in this case how that correlates with mito-ROS level. As far as I know their longevity strategy relies on better DNA repair and anticancer mechanisms. Encouraging, but how about immune suppression and loss of insulin sensitivity during treatment? Do not believe in those naked mole rat papers from Rochelle Buffenstein in Agin Cell. Badly done research. Mostly kits. Highly unespecific measurements. Nothing to do with our HPLC mass spec measurwments or ROS peoduction in isolated functional mitochondria. Mean ROS levels inside cells tell nothing, they depend on antioxidant levels. The key parameter is the RATE of mitROS production at the Complex I ROS generator site relevant for aging. So you imply that the longevity trick for naked mole rats is that they produce less mitROS than mice even if the systemic levels are higher? Hypomethylation of DNA happens easily by oxidizing the methylcytosine there is even an enzyme chain facilitating this (so it can be programmed after all). Hypermethylation of previously unmethylated sites might be a byproduct of maintenance methylation. So I wonder whether you know of research where mtROSp is throttled back or forth in cell cultures with genetic engineering tools? Would be quite interesting to see the result, for example a comparative assay on p16 expression in case of human cells. So what is your evidence that it isn’t damage accumulation (including but not limited to mitochondria)? Seems to fit the evidence rather well – a robust aging process that can be intervened in at numerous places but with only limited gains from each one. The only plausible argument I’ve ever seen against damage accumulation is that something else kills us first, i.e. senescence driven by a runaway development program (i.e. MTOR), and in this case we would still need to address damage at some point. My point wasn’t that there is no damage accumulation, but that there is a program behind it and is not a random process. The epigenetics of what, though? There are so many different cell types, and so many ways of turning genes on and off we haven’t even discovered yet – it could be a hundred years before we even get a clue of an underlying clock – if there even is one. Better for us just to get on with SENS and then wait for the rest to be revealed to us when we are all perpetually youthful and in no rush – right now there is a considerable rush, even for those of us who are relatively young! Yes I totally agree. Right now I would invest 80% of the resources to damage repair therapies and 20% to investigating more about epigenetics in case some discovery closer to the root cause accelerates the research in other fields. Once we have a comprehensive enough therapy to provide LEV I would slowly invert the balance. Aevita (or Mark?) said that metformin is interesting. I have been interested too because it acts on Complex I (the place where ALL the decrease in mitROSp occurse in all the different kinds of DR). b) Somewhere I read long ago that there are gene polymorphisms affecting complex I in some centenaries, and is some mutant mice (I think paper was by some Japanese people yeasr ago). I have ben always interested in metformin because it acts on Complex I (the place where ALL the decrease in mitROSp occurse in all the different kinds of DR). Agree, it would be nice if there is a shortcut, and I too take some (limited) supplements in the hope that they will contribute in some small way to a longer, healthier life – it could make the difference! Do you have any particular reason to expect Plastomitin to do more than MitoQ? I was originally very hopeful about Mito targeted antioxidants, but I am less sure now for various reasons. What made you wary of it? I just think it won’t help that much – because you’d need a preposterously huge dose to quench a significant amount mitoROS, therefore something like calorie restriction or a mimetic would be better as it would reduce the rate of MitoROS production, rather then having to quench it later. Also it is rather expensive! -1) Aevita, are you working in Spain? If yes, it would be nice to meet someday to discuss directly. -2) Mark, Aevita, I think I have some answers to your many questions. Why do not you send me your eamils. I can send you a draft of a big review I wrote with these (120 pages, 250 citations too big to insert here). 3) I am pressed with various deadlines but I will read in detail the paper from Alberto, my previous student who did part of the protein methionine restriction and mitROSp work for his PhD hhere at Madrid. Abstract: The Mitochondrial Free Radical Theory of Aging (MFRTA) is currently one of the most widely accepted theoriesused to explain aging. From MFRTA three basic predictions can be made: long‐lived individuals or species should producefewer mitochondrial Reactive Oxygen Species (mtROS) than short‐lived individuals or species; a decrease in mtROSproduction will increase lifespan; and an increase in mtROS production will decrease lifespan. It is possible to add a furtherfourth prediction: if ROS is controlling longevity separating these parameters through selection would be impossible. Thesepredictions have been tested in Drosophila melanogaster. Firstly, we studied levels of mtROS production and lifespan ofthree wild‐type strains of Drosophila, Oregon R, Canton S and Dahomey. Oregon R flies live the longest and producesignificantly fewer mtROS than both Canton S and Dahomey. These results are therefore in accordance with the first prediction. A new transgenic Drosophila model expressing the Ciona intestinalis Alternative Oxidase (AOX) was used to testthe second prediction. In fungi and plants, AOX expression regulates both free radical production and lifespan. InDrosophila, AOX expression decreases mtROS production, but does not increase lifespan. THIS RESULTS CONTRADICTS THE SECOND PREDICTION OF MFRTA. The third prediction was tested in flies mutant for the gene dj‐1β. These flies are characterized by anage‐associated decline in locomotor function and increased levels of mtROS production. Nevertheless, dj‐1β mutant fliesdo not display decreased lifespan, WHICH AGAIN IS IN CONTRADICTION WITH MFRTA. In our final experiment we utilized flies withDAH mitochondrial DNA in an OR nuclear background, and OR mitochondrial DNA in DAH nuclear background. From this,Mitochondrial DNA does not control free radical production, but it does determine longevity of females independently of mtROS production. In summary, these results do not systematically support the predictions of the MFRTA. Accordingly,MFRTA should be revised to accommodate these findings. What DR (and PR and MetR and rapamycin) do (mainly, not only) is to impact signaling proteins (same with the long-lived mutant mice) which signal to the nucleus (TFs etc) and expression of hunderds of genes vary in each tissue in approprioate proportions (eg. some subunits of the hydriophylic arm of complex I dowmodulate the rate of mitROSp , delta5 and 6 lower DBI , and ATGs increase autophagy, the result being up tu 1.4 increase in maximum longevity in mice. Of course CARS can have more than these 3 aging effectors (executors of the aging program). But we should discover them. With this holistic CARS in mind is easy to understand why changing ONLY 1 aging affector can have no effect on longevity, especially in mice. In addition Alberto experimental manipulations can have secondary effects (AOX obviously, dj-16 severyli impared not normal animals, I should read in full). Another example is atenolol. We decreased DBI in mice using it but longevity did not increase (Gomez et al Aging Cell 2014) but we got a bad effect on cardiovascular system (beta-blocker) ONLY at old age and ONLY in a subset of aniamlas. Whereas Shmookler-Reis decreased the desaturases by genetic means in C. elegans (much more simple animals no heart like mice) and got decreased DBI and increased max. longevity. So Alberto´s hard conclusion is obviously wrong. Mother Nature “knows” what it does. All long-lived animals well tested (not kits) have less mitROSp and less DBI (no exception). And this is the most important thing if we want to go beyound the 1.4 fold life extension effect of DRs and single gene mutant mice. Hola Gustavo, vivo en Madrid asi que seria un honor poder hablar contigo en persona. Te he mandado un email a tu correo que aparecia en el directorio de la UCM, si no es una cuenta que suelas utilizar ya me dices como podemos contactar. The flaws you mention about the study that contradicts the MFRTA are interesting. I hope that other groups replicate the experiments and we arrive to a consensus. From the CARS you mention I was not aware of DBI. Is it something that we can modulate favorably with diet or ß-blockers? Would you recommend atenolol as an antiaging compound for humans or it has only validity for research? I agree that addressing only one cause of aging would probably not increase maximum lifespan very much – if you look at DR or Rapamycin it is both reducing MTOR (protein creation rate) and decreasing MitoROS, which is probably why these have been the best (non-genetic) inventions to-date. I doubt that the various causes of aging are completely independent however – for example MTOR and MitoROS obviously linked, so as we start to intervene in more causes we should get a nice additive effect. So what can we do now? I would try metformin or Berberine – reduce MitoROS at the Complex I site; at least you’ll live to a decent age in good health even if the maximum is unchanged (you won’t die early) – and by then something better should have come along (I hope!). I believe there is some data on reduced human mortality on older people taking metformin, although it is controversial – I’ll see if I can find the paper. I agree with Aevitas, GaborB and Gustavo. Besides trying to decipher AP and trying to mitigate damage (senescence ROS free radicals) there is a third door which seems to be quite well understudied – that of upregulating activating repair mechanisms. My research has already identified natural defense agents for ROS and impaired autophagy but one has to be cautius as some level of oxidative stress is required for some cellular functions. If one agrees with the findings of Prof Hayashi of Tsukuba Univ the rate of damage for the young and old is the same what AP changes as we grow old is the efficiency of repair mechanisms. My team is preparing clinical trials to confirm some of our theories. I am looking for an authoritative compendium of all the various repair mechanisms in humans unveiled in all their complexity. 2015 Nobel prize was won for discovering some of the mechanisms. If anyone has come across an exhaustive compilation then please do point out. Will truly appreciate. Me and my team are also focusing on identifying the best diagnostic methods to measure levels of both the damage and repair effectors. As any upregulation or downregulation without constant modulation to ensure levels close to healthy young controls is a recipe for disaster. I also welcome any interest from aging researchers wishing to collaborate. ok guys here we are. cellular reprogramming without dedifferentiation simply by short term exposure to the Yamanaka factors- thats the holy grail. actually lot of references in the article about prior research claiming that it was already done in vitro? I didnt know about it. Gustavo and all, I would like to join the comments with some thoughts. I agree with mitROS being a central part of the aging program but the idea of ROS producing damage and thus aging seems to me to be incomplete. As superoxide and probably all mitROS have physiological function as part of the cell energy substrate regulation system, I would like to point out two things I think are missing or have not been addressed in deep to my knowledge. First, if mammals of longer lifespan are able to live at a lower level of ROS generation the necessary adaptation on the ROS sensing systems should accompany the decrease in ROS levels. Just decreasing ROS without increasing the capability of the rest of the cell to sense them would leave the cell without a working energy regulatory system and for instance, unable to induce insulin resistance once glucose utptake have reached too high levels in the cell cytoplasm. I haven’t seen any report with regard to that other side of the story and I think should be fundamental to complement the theory. Just inhibiting/reducing ROS production capability could potentially do more harm than good if no improvement in other cell systems/functions is achieved concomitantly. Second, ROS probably affect the epigenome and drives forward the aging program. I have not seen any mechanistic idea to connect those two but given that there is certain level of reversibility on aging markers as result of cell reprogramming, that should be the case. I tend to think that a relationship should exist between “cumulative ROS” and aging but not a clue how to connect those two dots and the idea of “damage” seems to be inadequate. I would like to hear anything you think in that regard. I wouldn’t call it the Holy Grail but a very interesting proof of concept, the best result since the senolytics paper by Kirkland. Let’s hope something similar is achieved with small molecules which could be a lot safer and simpler to translate into clinics. I think all this is wrong. (HYDROXIL RADICAL OH. WILL DAMAGE ANYTHING AROUND TWO MOLECULAR DIAMETERS OF ITSELF, and Lipid Peroxidation is an autoamplificative exponential-like chain reaction, one single initiation, if not stopped, being capable in theory of destroying the whole cell membrane. If anyone knows of other thing being produced endogenously by the organism with such capacity for cellular macromolecule destruction, please tell me. I have never heard of their existence. ROS are in a sense like radiation from an atomic bomb. In fact, the “O2 effect” is well known to radiologists. If there is high pO2, radiation damage increases a lot. I do not believe in ROS as signals. Signalling is done throughout the cytoplasm through proteins like mTOR, P13K, MAPK, etc etc., not by ROS. Please note that ROS signals postulated to act at low (e.g. nanomolar) concentrations will be absolutely erased by micro-to-milimolar ROS bursts from the huge amount of mitochondria hanging around throughout the cytosol (mitos are a large volume of the whole cell cytoplasm). I have always thought of those mitROS bursts. Now they have been measured in vivo. Concerning ROS they cannot “accumulate” (that is physics). Papers saying they measure “ROS concentrations in whole cells” are all wrong. ROS last something like nanoseconds only (depends on the particular ROS species). They are so reactive that they cannot accumulate. What matters and can be measured is the RATE of mitROS generation of the ROS generator of the hydrophilic domain of complex I relevant for aging and species longevity. Because what matters is the LOCAL ROS levels just AT THE POINT of ROS generatIon at that domain. But just there, Not a few Amstrongs or nanometers away. Concerning epigenetics I think that they can intervene during aging (from young to old). This is in addition to the basal aging rate of the young being determined in each species by the Aging Program-AP lying in the nucleus of the cell. That AP has, at least, 3 aging efectors (executors of the AP) known with more or less evidence: a) the rate of mitROSp, b) the DBI (and thus the rate of membrane lipid peroxidation), and c) the Autophagy rate. (Prenuclear) signaling, plus the nuclear AP, plus the (post-nuclear) Aging Efectors is what I call CARS (Cell Aging Regulation System) trying to me more holistic. CARS is an open model open to anyone demonstrating further mechanisms of aging. A model to be improved in the future by further investigations from everybody. Mechanisms included in the CARS must apply to BOTH the mitotic and postmitotic tissues of ALL the main vital organs. My Gene Cluster of Aging proposal of 2008 (in Biogerontology) is just a firs idea concerning how AP could be organized (generally speaking). Of course CARS must be more complex including epigenetics, feedbacks among CARS components, and CARS must be integrated at whole organism level including intercelular effects in the tissues, cellular redundancy (Gavrilovs proposal), and blood signals between tissues et cetera and up to the group (above individuals) and to the ecosystem level. Al that is necessary (at minimum) to fully understand aging. Among these mitROSp is the one with more evidences on its favor BOTH between species and in the different DRs and rapamycin treatment. But of course more aging efectors (executors of the Aging Program) could be added. This is what I think after 30 years of continuous basic biological research about MFRTA in different vertebrate species. However, for me what is more urgently needed is to acquire knowledge about the Aging Program lying in the nucleus. There is a lot of research about the pre-nuclear signals, much less about the 3 aging efectors, and almost nothing (at molecular biology level) about the nuclear AP. I worked almost 30 years concerning aging effectors a) and b). In 2008 I made a theoretical proposal concerning the AP (Barja, BiogerontolBiogerontology. 2008 Feb;9(1):57-66. Epub 2007 Oct 31.
is it possible that DNA methylation marks and hystone methylation marks could be oxidized? My understanding is that one way of removing methylcytosine is through oxidation with 3 or 4 intermediates. But reading Gustavo’s post about mitROS particles lasting nanoseconds only makes me wonder whether they ever get to the cell nucleus? What gets to the nucleus is not mitROS but their consequences. They cut mitDNA in pieces, and the mitDNA fragments travel to the nucleus and insert in nuclear DNA through the pericentromeric region of the chromosomes. From there they move to all the chromosome arms (just the same as during the evolution) and also perhaps other kinds of nuclear DNA damage apart from altering structural genes and regulatory regions and causing cancer. We are now looking at these possibilities. I am an avid follower of longevity research and life-extension ‘practitioner’ but I have no background in biology (I am a structural engineer by trade). One supplement that I wanted to bring up for discussion regarding Gustavo’s mitoROS comments (and would be interested in hearing people’s feedback on) is Glucosamine. My understanding is that it increases mitohormesis (by mimicking a low-carb diet) and thereby generates a cascade of impressive and positive downstream effects including mitochondria biogenesis, and increased lifespan, decreased all-cause mortality in humans. I am curious as to whether or not the effects of Glucosamine it’s resulting hormetic effect on mitochondria would plausibly also decrease mitoROS and be a cancer-lowering and life extending supplement (or would it increase mitoROS and ultimately be a supplement that would be undesirable to consume). Until now I have personally stayed away from exogenous anti-oxidants and very much in favour of supplements that act via xenohormesis and thereby upregulate NrF2 and ramp up the body’s own endogenous anti-oxidant production. Essentially I am wondering if glucosamine would (in theory) go well with Berberine/ Metformin or if the effects would oppose each other – I understand there are unlikely to be a study testing this so just your educated expectation. I look forward to any response!! Nature Communications Article published 8 April 2014. Weimer, Priebs, Kuhlow, Groth, at al. Please see the survival curves with glucosamine. It is only around 160 weeks (max perhaps 1 mouse 180?). Therefore, this is the same problems as with telomere manipulated mice. !60 wks is only 3,07 years. BVut normal maximum longevity (the one inversely related to aging rate) is 3,5 years at least (something between 3,5 and 4.0 would be more exact so around 3.75). Therefore “increasing” longevity of the controls used by the experimentator to 3,07 in the experimental “longlived animals” is not to increase longevity ABOVE THAT NORMAL FOR THE SPECIES Mus musculus. That would be equivalent to increase longevity of a human group, after the tratment with (e.g.) glucosamine to 94.1 years (3.07/3.75 x 115 years of maximum human lifespan in various individuals, Jean Calment is just 1 single individual, so not so sure, and see critic in Tom Kirkwoods book about possible intentional confusion between mother and daughter in this special case due to maintenance of their flat and pact with a lawyer….I do not know but it is just the only case reaching 122 and the next many are various years less). But “increasing human lifespan to 94. 1 years” nobody will consider this “increasing human maximum longevity” because it is 115. To increase human lifespan with glucosamine etc. would be to produce humans with more than 115 years of age. Question: I am examining the NIH funded “RoadMap Epigenomic Consortium” Centers located at mostly universities in USA. Could anyone please make comments on how to use select data toward understanding and using this vast amount of data toward 80% of resources to “Damage Repair Therapys” suggested by Aevitas on December 16 above ? Would taking some basic ‘CR mimetics’ such as resveratrol, pterostilbene, GSE, quercetin, fisetin be counter-productive in trying to decrease our own mtROS? In general, antioxidants do not work because ROS levels must be decreased just at the point where mitROS are generated where mtDNA is also situated. I am humbled that you took the time to reply and I very very appreciative – thank you! Just to restate one item; would you then consider (for humans) to consume perhaps a few grams of Glycine per day to potentially reduce Methionine? (I am assuming 4-6g per day in divided doses). Do you have an opinion on the efficacy of Berberine (I will not take metformin or rapamycin as both are prescription) assuming one is already eating a metR diet. I am hoping this might provide some similar effect to rapamycin and/or lower mitROS at Complex I? or at least help reduce mTOR. I humbly & sincerely appreciate any/all responses. b) DR has lets say at least 4 dowstream pathways to the AP, and then the AP responds with at least (there are perhaps more) the 3 effectors that I commented above and longevity is increased up to 40% (x1.4 fold vs. normal controls of the SPECIES, rat or mouse) in rodents. Of these 4 prenuclear dowstream pathways of DR, 2 are shared with PR (protein restriction) and MetR (methionina restriction). In fact it seems that all or most of the effect of PR on longevity is due to MetR 8to a single substance, methionine). So, PR increases longevity up to 20% (x1.2 fold). And the other ONLY THING that increases longevity (consistently demonstarted various times, ITP plus more), Rapamycin, increases longevity through decreasing mTOR dowstream activity (not TOR main protein itself), increases mouse longevity, maximum, by 13,5%. In addition, we know that DR decreases also mTOR dowstream activity. So, why to take any drug at this moment (most likely side effects and/or decreasing effect due to body homeostatic reraction/adaptation to the drug, at least on the long term) if, in addition, the efect of those drugs OVERLAPS with PR and DR? The best thing to do right now is to do DR. And, if you like to fill up well your belly, then go to PR (half effect 1.2 fold, but you a¡can eat as much complex carbohydrates-mainy and some fats, as you like). Rapamycin (the only drug that has consistently demonstrated to increase longevity (only by 13%) in a mammal has an effect that is already obtained with PR and more sure with DR. I just found out about teloyears.com and their consumer test for average telomere length for $89. Does anyone know if you there is a (reasonably priced) service for sequencing of methylation state? I am ready to test out some more serious anti-aging interventions, but I would like to attempt to measure results against known biomarkers of aging, most importantly methylation state and telomere length, along with blood parameters such as CBC with lipid panel, TSH/free testosterone and some functional fitness measures such as VO2 max. I’m in San Diego, home of Human Longevity Inc and Health Nucleus, who has the most comprehensive analysis I have ever seen – including methylation/epigenetic state, microbiome sequencing, phenotype data collection, high resolution CT scan, and more. However, the cost for their service is $25,000. Even if I could shell out that much money, I intend to collect results periodically across my treatment period and follow up, so I am thinking every 6 weeks for a year. Not exactly affordable with Health Nucleus. But $89 for a telomere test? Done. Now maybe mean/average telomere length of leukocytes isn’t the best measure to use, but I think its a great start. I’d be interested, too. DNAmt clock is very new finding and telomeres are still dominating the popular press and I guess thats what really matters when you are sketching up a business plan. I contacted teloyears and 2 other consumer-facing sequencing companies 23andme.com, Helix.com, as well as Quest Diagnostics regarding DNA methylation testing. James Cuellar of Helix responded promptly, praising the question and letting me know their laboratory scientists are aware of this development and are already looking at possibly incorporating it into future product offerings, but stated that it is not in the pipeline for 2017. No response from the others yet. Jennifer from the 23andme team also said they are aware of the research and what they call ‘methylation analysis’, but can’t comment on what services or changes to reports might be available in the future. I also heard back from Teresa Clifton of LabCorp DNA Testing Division who was very courteous but simply said they do not offer this test at this time. Michael Fossel;. MD, Ph.D., and President of start up company called Telocyte, has published a recent book titled “The Telomerase Revolution (2015). Fossel is certainly one person in America who is in the frontiers of the “Telmerase Challange” now. In his new book, he offers a number of companies who is offering this service of “Telomerase Length Measuring”., including one of his “partners” located in Spain, a worthy university faculty member, and a long time leader in this field. But it’s not clear yet if there is a real utility to have one’s telomere length measured. I think it’s more worthwhile to work on “medical intervention therapy” that’s possible in the next decade if there is another “breakthorugh” or two, that is surely coming in this gowing field and industry. Makes sense ? Chris – First, there is a lot of scatter in telomere data. Some of this is real, and some is due to problems with the measurement techniques. It seems to be true that there are a few 80-year-olds who have telomeres just as long as a 20-year-old. No one thinks that they have the same life expectancy as a 20-year-old. Also, vice versa – young people with short telomeres. If there is anything to be learned from a telomere test it is relative – the change in your own telomere length from one year to the next. Also, you probably should use a lab that reports the shortest telomeres and not just the average, because it is the shortest that are the immediate source of trouble. I recommend the bestselling book of Elissa Epel and Liz Blackburn as a simple guide to interpreting telomeres and health.